Welcome back, we will cover XPath strategies today. This is an advanced and effective locating strategy as well (by cssSelectors was too!). While being effective, it can sometimes be confusing. So, let us delve on how to understand our often misunderstood friend and come up with the good code once for all. When all hope is lost, the only chance to save ourselves is to turn towards XPath strategy. Because, most of the time, we are going to be testing something that is existing and that cannot be modified. We don’t always have the control over the page to add in some Ids making automation that much of a simpler task. So stop ranting and get serious! XPath (XML Path Language): According to w3schools, XPath is a “path-like” language used to identify and navigate through various elements and attributes in an XML document. Thus XPath provides syntax for locating any element in an HTML document. If you have never been exposed to XPath in your journey so far, make it a point to understand XPath terminologies before proceeding any further. Especially, nodes and relationship between these nodes viz., parent, children, siblings, ancestors, descendants. Let us start with the easiest one for some motivation. Want to find the XPath of any element on the web page the easy way? Done. Want it to be in a perfect working condition almost every time? Also done. What about getting all this done in a jiffy? It got you covered rockstars! All you need is, ‘Firebug’! It is available as an add-on to Firefox browser. Click on the Firebug icon or press ‘F12’. Inspect the element whose XPath is required. The corresponding code will be highlighted in the ‘HTML’ section of the Firebug panel. And voila! 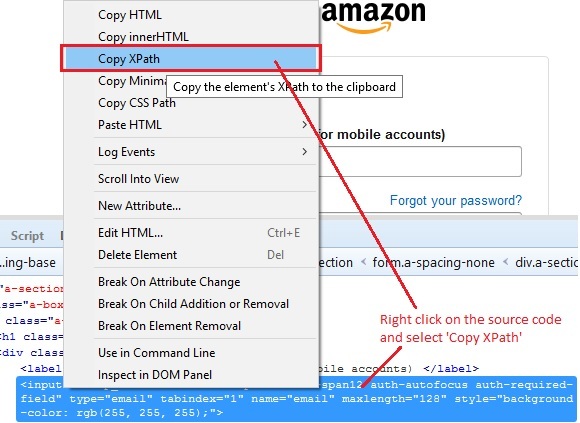 You have the ready baked XPath copied to your clipboard! If you wish for a detailed post on Firebug, take a peek here. In order to come up with an XPath from scratch, we first need an understanding of the two types of Xpaths available. They are, absolute XPath and relative XPath. It starts with a single forward slash (/). It starts with a double forward slash (//). ‘/ ‘ instructs the XPath engine to search for the element with reference to the root node. ‘//’ instructs the XPath engine to search for a matching element anywhere in the DOM structure. Element identification is faster compared to relative XPath. Takes more time to identify the element as only a partial path is specified. Even with the slightest change to the HTML DOM structure (e.g. adding a tag or removing one), absolute XPath would fail. Relative XPaths are shorter and are less likely to change, making them more dependable. With this basic knowledge, let us dive in! Explanation: Identifies the element pointed by the XPath. ‘//’ identifies the specified node and ‘@’ symbol is used to select the specified attribute which matches the given value. <input value="" name="FirstName" id="FirstName" spellcheck="false"
We can see that the ‘input’ tag has a ‘name’ attribute whose value is ‘FirstName’. form tag has numerous child div tags. In our case, we wish to choose the first div tag. This can be specified as, ‘div’. The number inside those square brackets , indicates the exact sibling that is to be chosen. What if multiple tags have the same attribute value? Or what if you wish to locate an element only when it matches BOTH the specified conditions? Explanation: Identifies the element with the specified tag_name having attributes that match the given values. 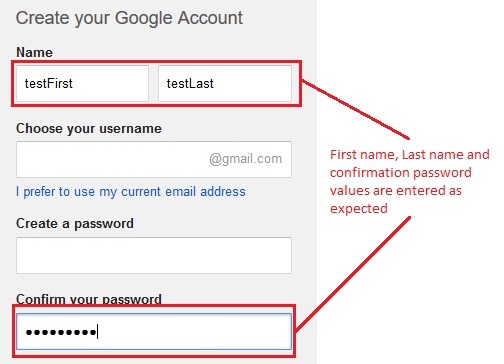 Example: Let us locate the ‘Confirm your password’ text box on the Gmail account sign up page. Notice that both textboxes have same values for ‘type’ attributes but different values for ‘id’ and ‘name’. So, in order to locate ‘Confirm your password’ text box, let us mention both its ‘type’ and ‘id’ values. Nowadays, most of the attribute values such as ‘id’, ‘src’, ‘href’ etc. are dynamically generated with a constant prefix or suffix. Imagine a web page with an image that changes every day. Its src can be ‘Image_random-generated-key_date.jpg’. In this case, we can locate the image by XPath with ‘img’ tag containing value of ‘Image’ in its ‘src’ attribute. Thus by specifying a partial value of the attribute, we can locate the element. Explanation: Identifies the element with the specified tag_name with an attribute that matches the given partial value. Example: Let us locate the ‘Next step’ button on the Gmail account sign up page. Notice that this XPath identifies the div element that contains a class attribute with a partial value, ‘button’ (<div class=”form-element nextstep-button“>) and then locates its child ‘input’ tag which is the submit button. You might come across cases where you wish to find all the elements having a particular class or name and perform certain operations on them. The asterisk (*) symbol comes to our rescue! Example: Let us locate all the elements having a class value ‘goog-inline-block’ on the Gmail account sign up page. This will locate all the tags that contain the value ‘goog-inline-block’ in its ‘class’ attribute. Make it a point to use ‘findElements’ so that all the identified web elements can be added to a list. If ‘findElement’ is used, it will only return the first element that is identified. Parts of the code are explained as part of each technique discussed in this post. In JUnit window, green bar shows that the test case is executed successfully. Console window shows the absence of any errors. It also displays the total number of web elements located with the asterisk symbol along with the attribute values of a dropdown and a button. Take a break fellas! Our next post will be the final one on locating elements strategies. So don’t miss it! See you soon and have a nice day! I should really appreciate the consistency in the quality of each article. This particular one made my day a lot better! I now can proudly say that I understand XPath now. Really excited to try out a few examples! Good article.Very useful one.Explanations were clear.